The Haver & Boecker Roto Classic packing machine for cement. The Australian arm of Germany’s Haver & Boecker is now going beyond mineral processing to offer the group’s complete portfolio of products, including diversified processing, storing, mixing, packing, filling, palletising and loading solutions. Feige Filling: Filling technology for the packing of building materials, chemicals, paint, lacquers and foodstuffs into drums, buckets, canisters, containers or bags. Sommer: Stirring and mixing systems for oils, grease, paints, lacquers, adhesives and sealants. Behn + Bates: Valve-bags and open-top bag packing machines for food stuffs and animal feed. "We have recognised the demand in Australia for a complete, integrated offering of high quality, high efficiency equipment across processing, packing, storing and loading and we’re pleased to now supply the complete range of Haver & Boecker products to the market," Haver Australia managing director Gabriela Emanuele says. 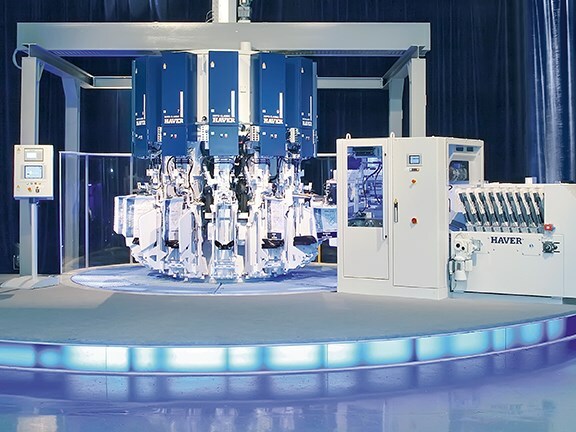 She adds that the technologies offer different degrees of automation depending on the individual applications and the varying requirements of dry and liquid materials. "Our on-the-ground sales and service teams, and spare parts storage, means our clients have direct access to OEM maintenance services and OEM parts – there is no third party involvement," Emanuele says. A spare parts and maintenance service for Australia, New Zealand and Papua New Guinea is available through Haver & Boecker Australia’s warehouse in Malaga, Western Australia. Service technicians are based on both the east and west coasts.